Some nights inspiration hits and dinner just comes together… with some leftover pistachios from a recent baking project and some arugula… I made some really good Arugula Pistachio Pesto! 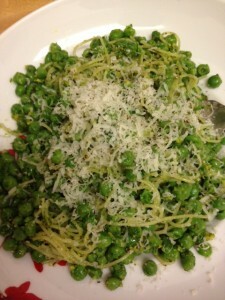 I’ve been trying to be healthy so I mixed it with half pasta and half peas… delicious! Mix is all together in the food processor and then enjoy with your favorite pasta. You’ve always loved peas!! I do too and will have to try this.